This well maintained former L&N (and Tennessee Western) Depot is in the town of Collinwood, in southern Wayne County. 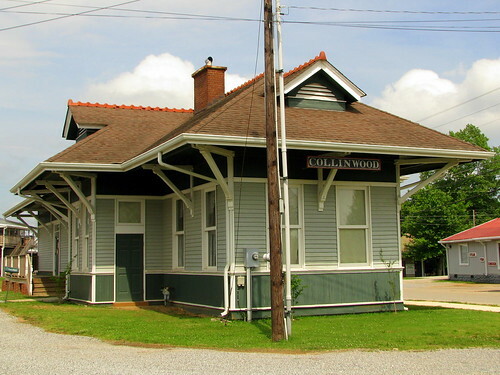 The Railroad first came to Collinwood in 1913, and this depot was built in 1916, and expanded in 1918. Railroad operations here ceased in 1939 and the tracks were removed over the next two years. Over the next two decades, the building was used as a house, a warehouse and a grist mill. It served as city hall for 15 years and then a senior citizens center afterwards. The Depot was added to the National Register of Historic Places in 1988 and the grounds went through and extensive renovation in 2001. On the day of my visit, there was a sign by the entrance that they were opened. Today, the depot serves as a library, and you won't find anything train related on the inside. 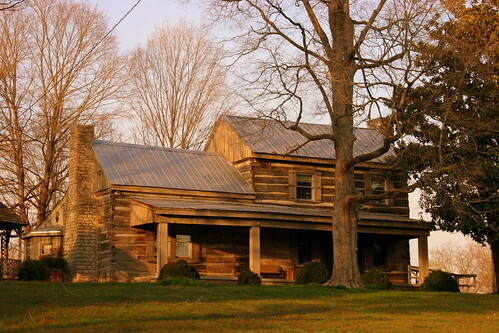 This two story log house was built in 1807-08. It is not only one of the oldest houses in Nashville, but is also one of the oldest two story log houses in Middle Tennessee. It has evolved through the years into a unique historic property which is listed on the National Register of Historic Places. The house is built of chestnut logs with poplar floors. Original limestone fireplaces provide focal points for the parlor and Lucinda's room. There are fireplaces on each end of Buchanan Log House -- on the original hall and Parlor style. When the 1820 addition was added, the fireplace on the west end was removed from the original log home and placed on the west end of the 1820 addition; so the chimney on the east end has a fireplace in the Nave Room (downstairs) and in the Lucinda Room (upstairs). The chimney on the west end has a fireplace in the 1820 addition (now our dining room). James Buchanan, an early settler in Davidson County, married Lucinda East in 1810. The first log addition to the home was necessitated in 1820, to accommodate their growing family, which eventually numbered 16 children. The next addition to the house occurred in 1900. Two historical prominent residents were Judge Thomas N. Frazier who purchased the home in 1867, and his son, James Beriah Frazier. Judge Frazier was Criminal Court Judge for Rutherford and Davidson Counties, and was impeached during the Reconstruction Days because of his so-called interference in the ratification of the 14th Amendment. (He was later restored to office in 1870). James Beriah Frazier spent his teenage years in this home. He was a popular governor 1903 to 1905, and was a U.S. Senator 1905 to 1911. 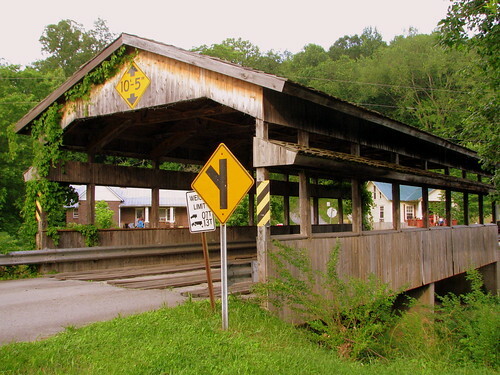 Here, Church St. crosses Salt Lick Creek as one of the two bridges near the middle of town. It is still open for vehicle traffic, although, if you've never done it before, it can be disconcerting to drive over a wooden bridge! It makes a great rolling, popping and creaking set of noises. 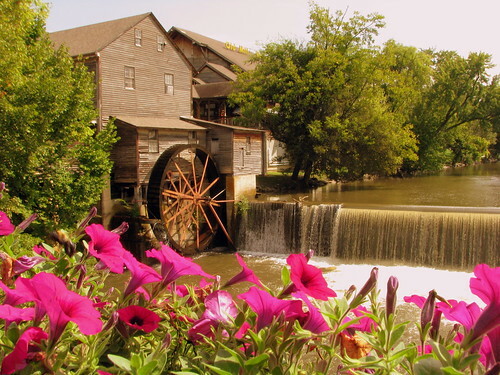 In those days, the mill was the hub of local activity and now, 180 years later is one of the most popular tourist spots around the Smoky Mountains. The adjoining restaraunt is also one of the most popular in Pigeon Forge. The Old Mill is also on the National Register of Historic Places. These two barns are along the highway that runs from Birmingham to Chattanooga in DeKalb County, Alabama. 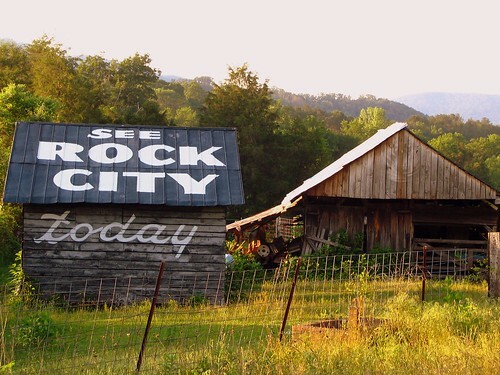 The See Rock City barn faces highway US 11. The other barn is a painted advertisement for Rock City and is visible along Interstate 59. 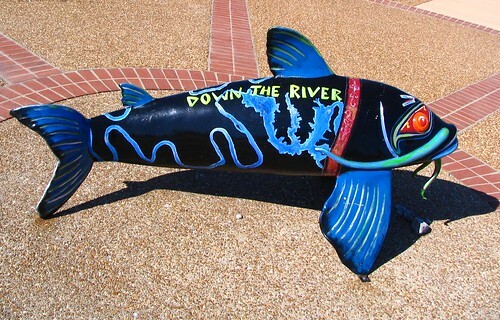 This catfish is located along part of the downtown Cumberland River Greenway, in the section near Bicentennial Mall. Several years ago, there was a project to place many of these artfully designed catfish (or is it catfishes?) all over the city. Since then, smaller towns have done this, such as Pulaski with turkeys and Crossville with otters. 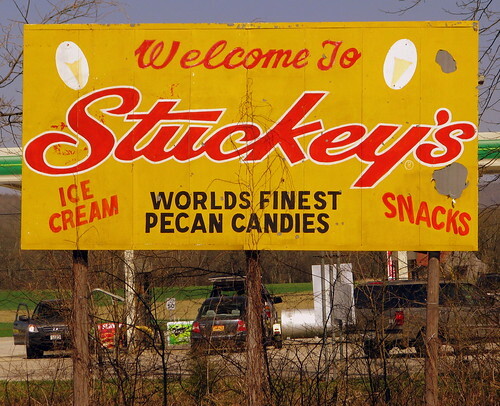 Stuckey's started off in Georgia by Mr. Stuckey, a Pecan farmer. 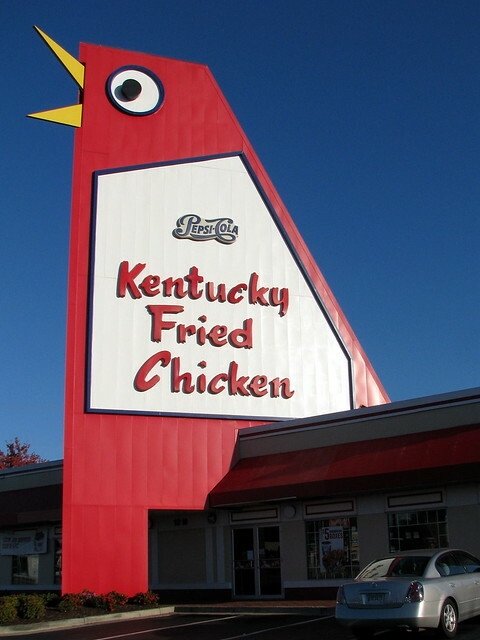 During the golden age of Automobile tourism, the franchise grew to about 350 blue-roofed convenience stores mostly throughout the southeast. They were best known for their souvanirs and their candies, starting with the pecan log roll. Hey! What's that hiding in the weeds? 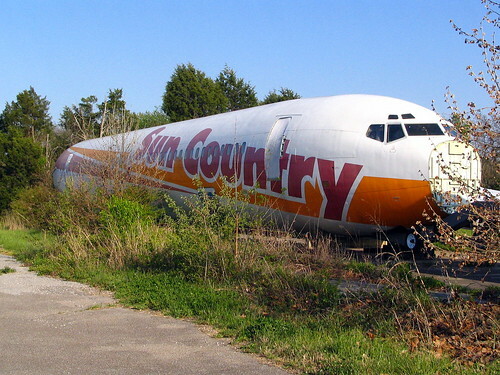 Why, It's a SunCountry 727 Airliner! I found this while driving around Smyrna, TN one day. It's about 10 blocks from the non-commercial Smyrna Airport, MQY and the former home of Sewart Air Force Base. SunCountry doesn't fly anywhere near here. If only it was resting on Cinder blocks, that would be perfect. Oh, and by the way, the Smyrna air show is a little over two weeks away, even though this plane will not be in it. 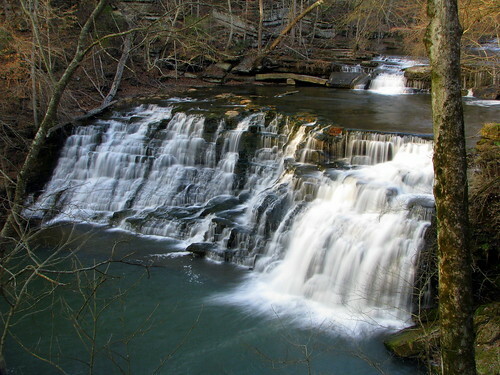 Perhaps the most scenic area in all of Coffee County, this waterfal is just outside of Tullahoma, TN. It's not a state or city park, but located on private property. The owners are gracious enough to allow visitors and have provided a small parking lot beside the street and a small path to the overlook. Ever wonder where I find some of the unusual places in and around the area? I have quite a large library for finding the best the state has to offer. Tennessee has its share of quirky and offbeat places, such as the Hotel with the ghost that steals spoons I mentioned earlier today, or the country market that serves something I'd never tried before that I mentioned last week. I learned about both of these places in a book called Tennessee Curiosities by Kristin Luna. 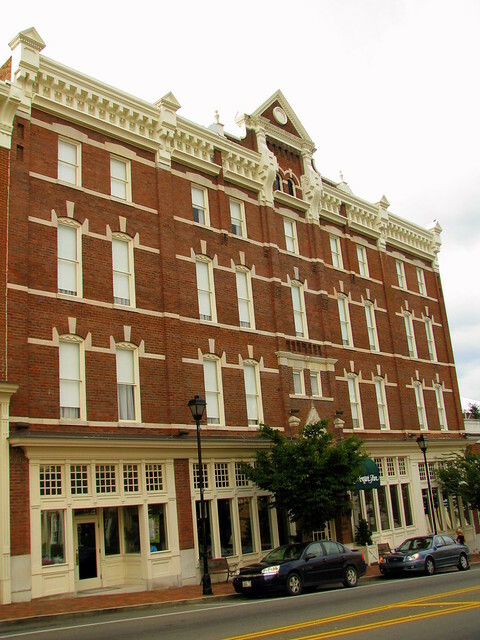 This small town yet fancy Hotel, originally built in 1884 to provide lodging for railroad passengers. The Inn is named for Civil War Confederate General John Hunt Morgan. Gen. Morgan was named after him. For those of you who like ghost stories, this place has one. When the main restaurant here was known as the Green Room, there was a popular waitress by the name of Green Room Grace. It's been 75 years since her death, but according to legend, she still lives here. She spends her time stealing customer's spoons. 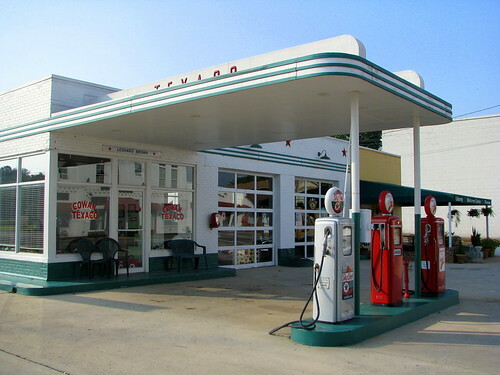 the local vinatge gas station has been preserved and now is used as a museum, library and tourist welcome center. This station is located near the important transportation intersection of highway US 41A before the ascent to Sewanee and the CSX train line before it begins its ascent to the Cumberland Mtn Tunnel. 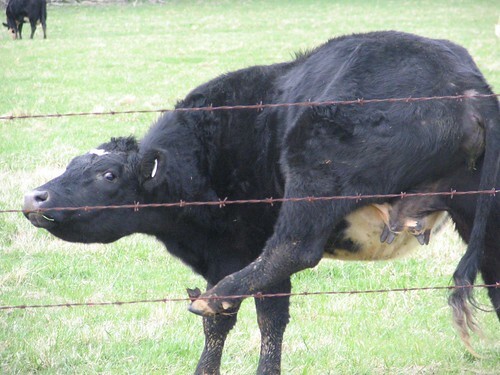 This cow has an itch, but was embarrassed when she saw me taking her picture. I saw this one day when I was driving on a back road just off of Highway 41A in Bedford County, Tennessee. 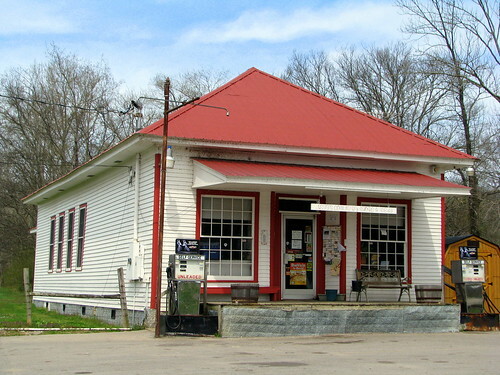 Nett's is located in Williamson County just south of Lieper's Fork in the small town of Bethel. "Nett" is Barbara Annette Beard Dodson who visited the store as a child and today owns the place. While the restaurant offers typical southern cuisine, they do have one offering that you might not find anywhere else - Rooster Fries. Instead of being like french fries, they look like Chicken Nuggets but are actually Rooster testicles. No, I didn't try any. I'm not in a mood to get political, but hey there's something you can't ignore when April 15th comes around. Luckily, if you stumble across this and you haven't done them yet, you've got a couple of bonus days this year! In the 1960's while planning for the upcoming need for more electricity, TVA bought some land off the Cumberland River in Trousdale County. 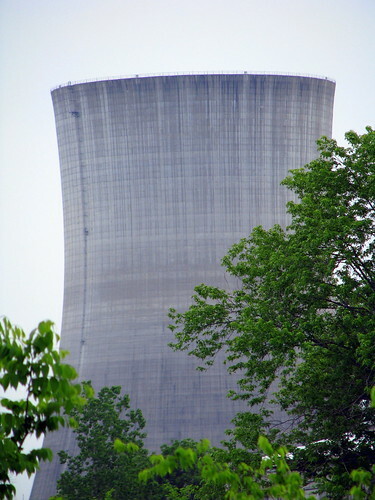 Plans called for a Cooling Tower for the Hartsville Nuclear Power Plant. Construction started on the plant in 1975. It got this far to make what you see here, but in 1984, the plans were cancelled. I don't want to think about how much money was spent on it. It's time for Minor League Baseball in Nashville! OK, the season really started last week. I'm a little bit behind. Baseball is my favorite sport, and April is one of my favorite months because of it. 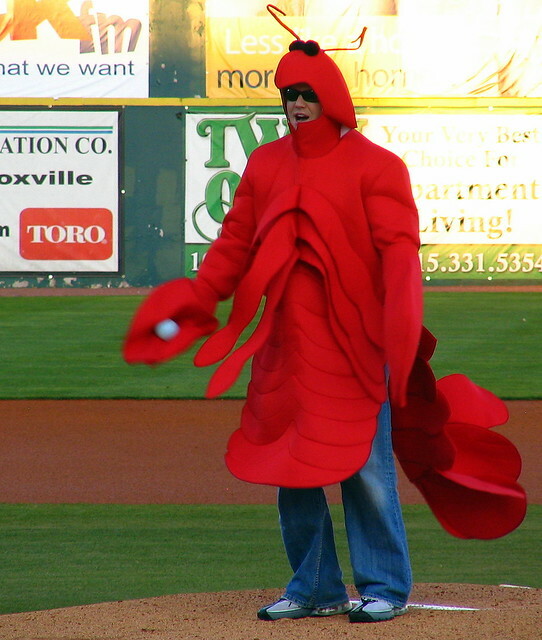 One thing I like about minor league ball are the weird promotions they have going on, such as letting a guy dressed up as a crayfish throw out the ceremonial first pitch. sources tell me that crayfish have really good split-fingered fastballs. By the way, did you know there was an endangered species found only in Mill Creek known as the Nashville Crayfish? 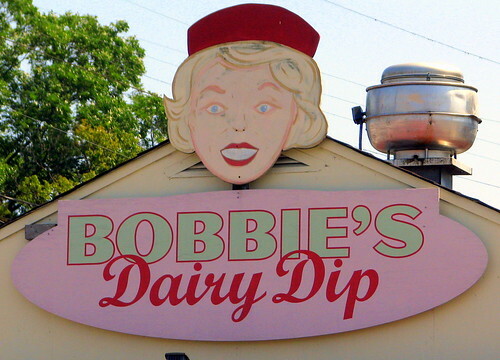 Bobbie's Dairy Dip is a popular 50's style walk up eatery along Charlotte Pk (US 70) on the west side of Nashville. 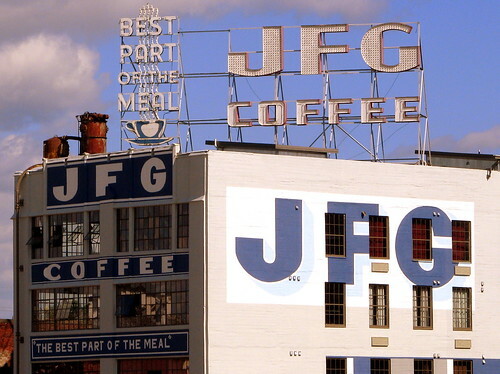 There's been a law proposed by Nashville's Metro Council to change the zoning laws to help preserve the older signs, which are a part of Nashville's past. Interested in historic signs of Nashville and new to this blog? Here is a good place to start! Located in Sevier Park (don't go there after dark) in Nashville, TN, this old mansion from the 1850s is on the National Registry of Historic Places. This was originally the home of Mary Benton, the widow of Jesse Benton who left Nashville after a duel with Andrew Jackson. 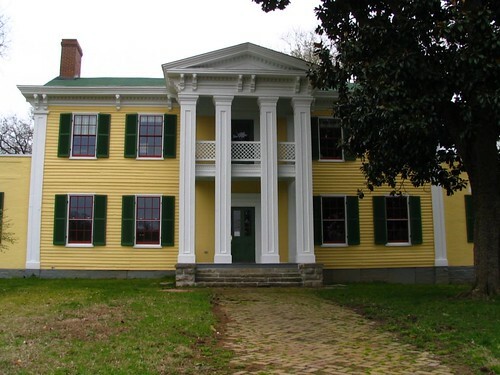 The home stood between army lines in the Civil War in the Battle of Nashville. Next, it was owned by prominent dentist L.G. Noel for 45 years, and then Col. Granville Sevier, who added the wings in the 1920s. Now, this holds the offices for the Metro Board of Parks and Recreation. If you have seen a picture of this mansion older than 2005, it was painted white. The Donoho along with The Armour and The Cloyd (now the Thomas House) are the big three old fashioned resort hotels of Red Boiling Springs. 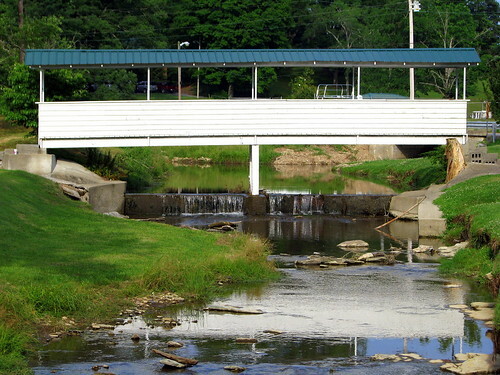 I suppose these days, the pedestrian bridge over the Salt Lick Creek here is more for looks than for use. (Who needs to walk to the street?) But, I am glad they have kept it looking nice. 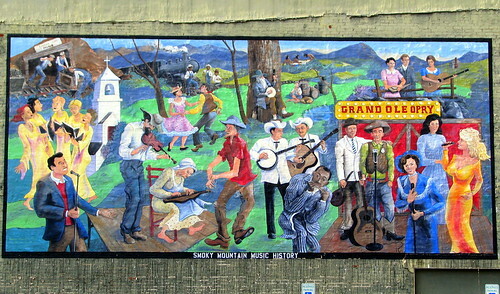 If I knew my country music a little better, I could identify more of the people depicted here. I think we have: Dolly Parton, Patsy Cline and Loretta Lynn in the bottom corner near the WSM Grand Ole Opry stage. Sixteen Tons mine in the opposite corner. Minnie Pearl dancing with someone. Lester Flatt. Earl Scruggs. The Carter family. A moonshine still and some Indians. 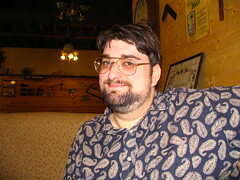 Knoxville's WDVX. Harmonica. Banjoes. 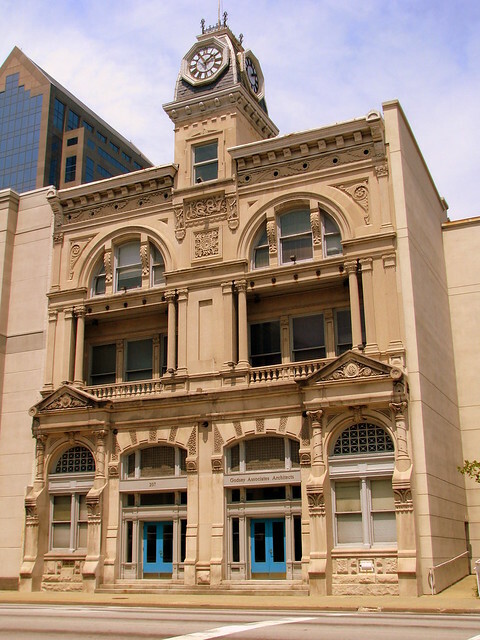 The German Insurance Bank Building was built in Downtown Louisville in 1887. Today, the building is inhabited by Godsey Associates Architects who bought the building when it had been neglected for years and restored it to its current great condition. It was designed in a Second Empire, Romanesque and Classical style by one of Louisville's noted German architects, Charles D. Meyer. It is rich in detail and made from Indiana Limestone. The clock tower was a popular local landmark and still lights up at night. The tower is square with a mansard roof. On each face of the roof is a clock. The roof is articulated by a cornice with brackets, and dentils. The tower has one window encased in stone. At the Start of World War I, the bank was renamed the Liberty National Bank in 1918. Since then, it had been threatened with demolition more than once and at one time also housed the local United Way headquarters. Today, it is on the National Register of Historic Places. Although you can't tell by looking at it, this used to be a Rock City barn, according to the book about Rock City barns by David Jenkins. It appears on page 156. This is now called Murfreesboro Road, but it is also Old U.S. 70S/TN1. This used to be the main road between Murfeesboro and Woodbury, TN. 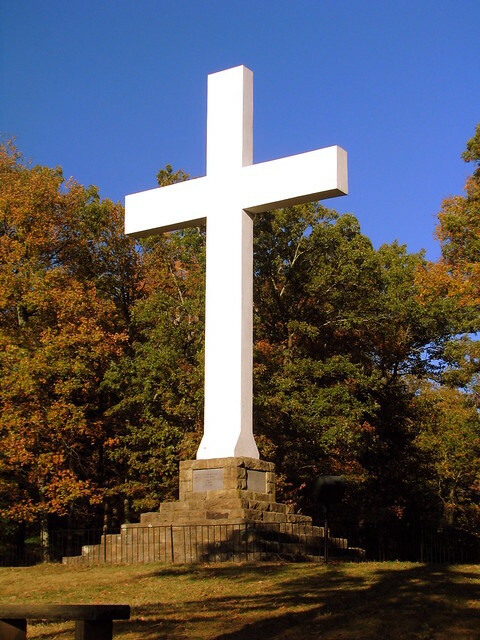 (Or on a larger scale, the Memphis to Bristol Highway, the state's first important cross state road.) It is located in Cannon County about a mile east of Readyville. When this was still the main highway, this barn was a great location for an advertisement barn. 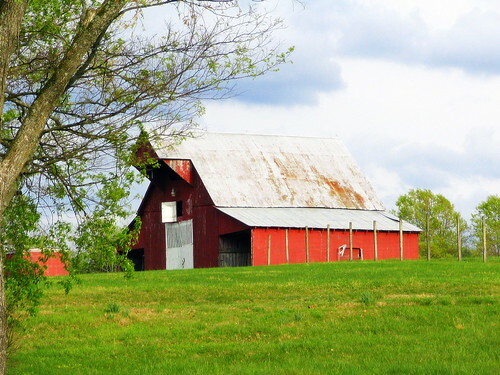 The road goes uphill and the top of this barn is seen not too far in the distance directly in front of streetbefore it curves to the left of the barn. The large roof of the barn is directly facing the street before the curve. The Current U.S. 70S runs parallel to this street about a mile away. Like most of the newer highways, The John Bragg Hwy is a straiter four-lane divided highway. This vintage neon sign was along Broadway (US431/70S) in downtown Nashville. According to one of my photo contacts, this sign was taken down a little over a week ago. 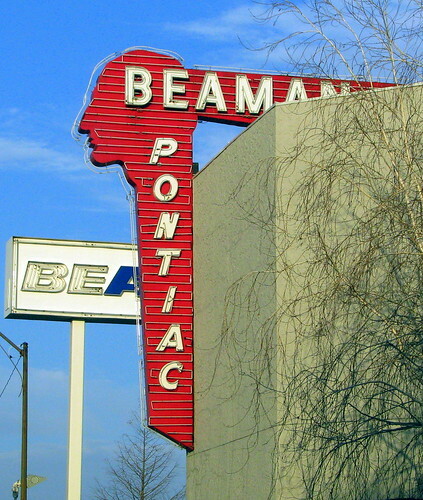 The good news is that the Beaman people plan on restoring the sign! Apparently, once it's ready to go, you won't be able to see it at this same spot anymore, but more people will be able to spot it from downtown and along the Interstate. 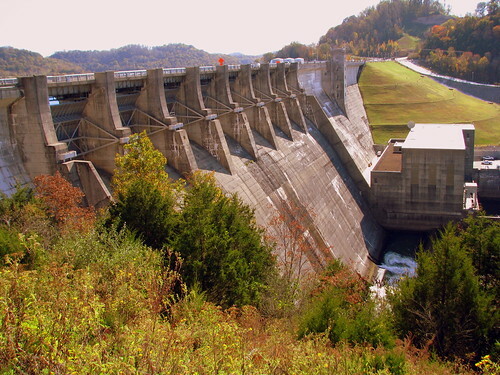 In January 2007, the U.S. Army Corps of Engineers placed Center Hill Dam under a high risk for failure, although I don't hear about it as much as the Wolf Creek Dam in Kentucky, upstream Nashville from the Cumberland River. Highway TN96 also crosses over the top of the dam. 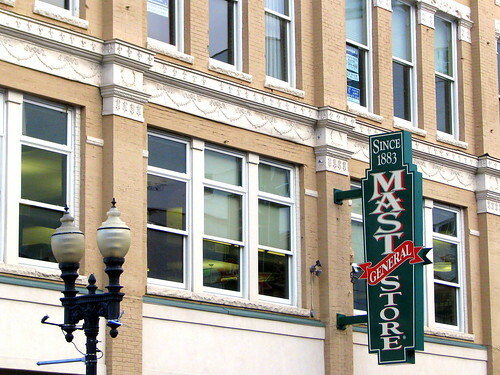 After a huge downtown fire in 1897 this building was opened the next year along Gay Street as McNulty Grocery and Dry Goods Co. More recently, after being vacant for nearly 20 years, a Mast General Store moved in and opened in 2006. Along the way, they restored the building to its Victorian era glory. 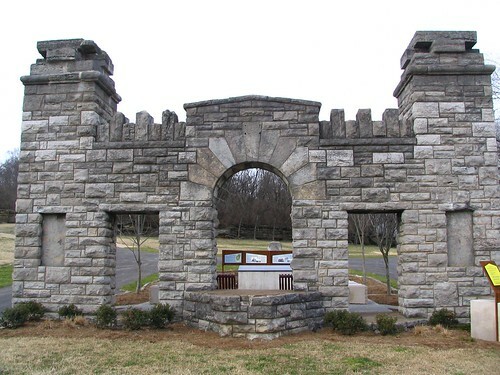 This stone entrance was built in the 30's in Nashville's first attempt to turn the civil war historic site into a park. The project at the time was a New Deal era Works Progress Administration project to restore the important spot from the Battle of Nashville into something the people could enjoy. World War II prevented the completion of the park and it soon closed to public access. It wasn't until 2004 that the work was finished and the park opened. 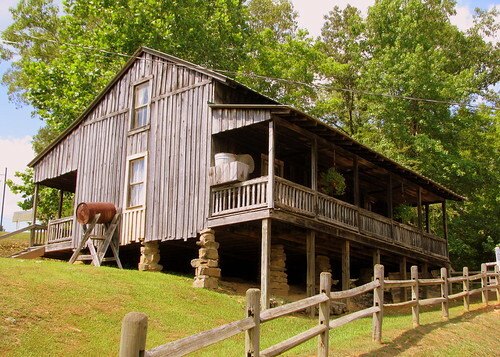 as part of the Loretta Lynn Dude Ranch in Hurricane Mills, TN is this Log Cabin. 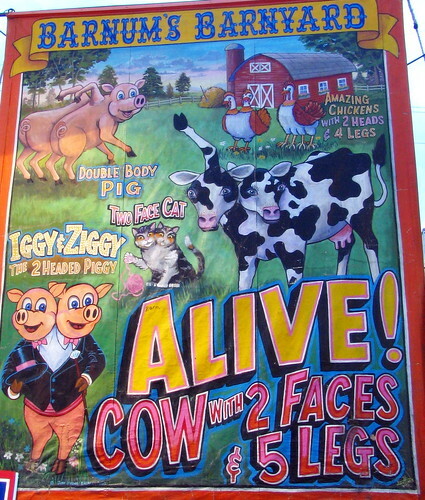 This was recreated to look like the home in Butcher Holler, KY to portray the rags-to-ritches legacy of her childhood as the "Coal Miner's Daughter"
This is one of the signs advertising the "Barnum's Barnyard" freak show in the midway of the 2007 TN State Fair. I love these signs. And why did I post this for April Fools Day? First, I couldn't think of anything better. Also, The two-headed pig won't really be wearing a tuxedo!